When I found out I was pregnant with my second, I immediately started thinking about how it would impact my first. Little did he know that his whole world was going to be changing. I worried mostly about how he’d react without all the attention. With my world so full of him, I wondered how two would fit and where the sacrifices would be made. So my husband and I tried to be very deliberate about the choices we made when it came to introducing Beckett into our home. The first thing we had to tackle was the new nursery – Beckett was going to use the same crib and furniture as Brogan (which Brogan was currently using). We worried about Brogan feeling like the new baby was taking his “stuff” (especially the crib) so we opted to move him into a toddler bed at 20 months (4 months before Beckett’s arrival). The hope was that those 4 months would be enough time to unattach him from his crib. It was – Brogan never once referred to the crib has “his”. He was proud of his new big boy bed, and was also excited about Beckett’s new room. We decided to make Brogan a book that would explain the transition. We knew there were books out there, but we wanted one that he could identify with, that spelled out exactly what was going to happen to him and that showed pictures of people he knew. I made it in Word, used clipart and pictures of his family, and even bound it with my binding machine at work. It went through his new role of big brother, that mommy and daddy were going to the hospital to have his brother, that his Gigi was coming to stay with him while mommy and daddy were in the hospital, and what it would be like with a new baby in the house (crying, mommy holding him a lot, things he could help with). We emphasized what Brogan was getting out of the deal – a new brother and a best friend. We really wanted their relationship to get off on the right foot! When we got home from the hospital with Beckett, Blake took Brogan out to buy Beckett a gift. We let him pick it out – anything (within reason) that he wanted his brother to have. We also gave Brogan a gift from Beckett. Brogan was so proud to have given his brother a present (I think this was more impactful than the gift Beckett got him!) It was really neat watching him puff up with pride showing off the present that he got his new brother! 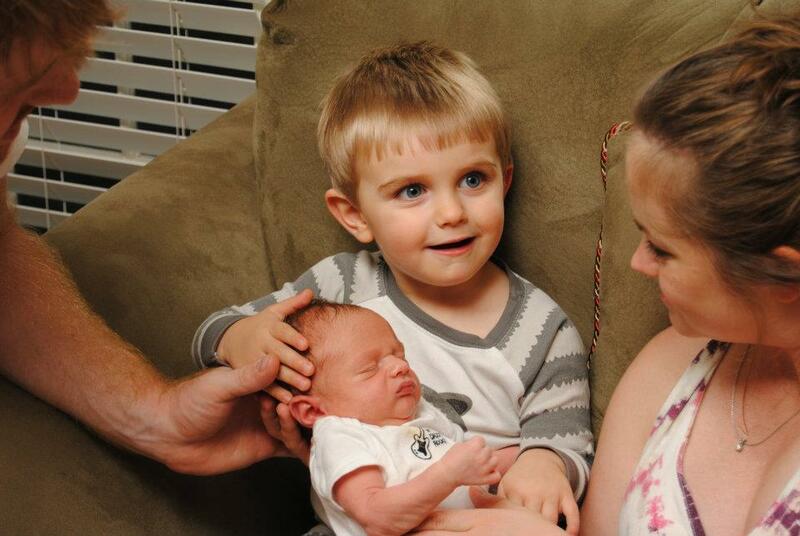 Welcoming Beckett into the family was a much smoother transition that we had anticipated. When Brogan was jealous, it was only short-lived and didn’t seem to temper his feelings toward his brother. Who knows if anything we did in preparation worked, if it was just Brogan’s nature, or if we simply got lucky, but I’m proud to say that they seem to actually like each other! Brogan has a pretty big personality and is always seeking the limelight. We worried about this need to be noticed, but didn’t consider that in the end, he would make sure he was noticed! So if too much attention was paid to the baby, Brogan would pick up his guitar and sing a song, problem solved! While I’m not so naïve to think they will always get along, I’m praying that this liking each other thing will last at least a little while longer. Brogan: Mommy, I don’t love you anymore. I don’t love you, or daddy or Beckett. I just love myself. Brogan: Mommy, I changed my mind, I only love myself and Beckett. This entry was posted in Kids and tagged Advice, Baby, Brothers, Children, Family, Kids, New baby, Planning, Siblings by biscuitsncrazy. Bookmark the permalink.